Chumps are like a short set of apehangers, with 8 inches of ride. A classic, timeless style that looks gives a comfortable riding position. At home on modern and vintage motorcycles alike, they are run on everything from FXRs to rigid and stock-framed Shovelheads to modern Triumphs. Great bars, very comfortable riding position. Excellent fit and finish, good solid feel! 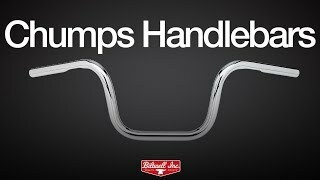 For those who have an 'S' model Sportster with the stock handle bars (56110-98) the brake line is a bit of a stretch but can be utilized (remove the clip at the triple trees) until a set that is about 4 in longer (upper end) can be fitted. Clutch cable was a bit of the stretch too but will work if you remove the clip at the bottom. Throttles were no problem (I'm runnin an HSR42). Bars came in right on time. Easy to install and look great on the bike! Stock brake line was just long enough to reach, but I replaced it anyway just to be safe. Overall really satisfied. Looks badass on my 2004 Sportster Roadster. Great bars. Great packing. Very fast shipping. I would recommend LOWBROW CUSTOMS to anyone. Very nicely made bars. The fit is what I was looking for. I have a 2017 iron883. Would these fit the cables I have without an extension kit? 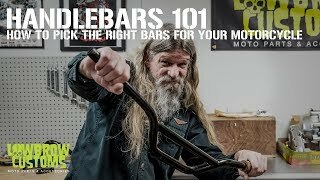 From what research I have done on some of the online motorcycle forums others have used these bars where some have changed the brake line and other have not . Most are saying the cables will work but I can not be 100% on that with out doing it myself.